The short answer is yes, but you do need to be careful about how you go about doing it so that you can still claim your tax deductions and that you can have a smooth rental process. Today I’ve got a few tips about renting your property to your family or your friends and we’re also going to talk about some tax implications as well. More on renting your property to yourself or living in your property whilst renting it. How Much Rent Will You Charge? When it comes to renting your property to your family or your friends, the first thing that you need to think about is how much rent you’re going to charge. And you need to be careful with this, because the ATO states that if you’re renting the property for below market value, then some of your tax deductions might not apply, or all of your tax deductions might be negated completely. So if you’re not renting the property for the market rate and you’re giving your family or your friends a great discount, well then you’re probably not going to be able to claim tax deductions that you would be able to claim if it was a standard investment property renting for market rate. I do suggest that you go ahead and speak to your tax accountant about this one because what defines the market rate and everything fluctuates so you need to assess whether you’re close enough to market rate or at market rate or if you’re too far below to claim anything. But there’s definitely something to consider. 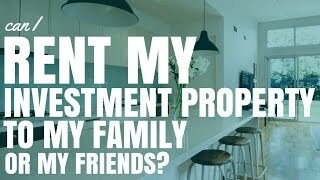 If you’re going to give your son, or your daughter or your mother or whatever, cheap rent then it may not act as a regular investment property. So do check that out. Be strict with the rent, is what I advise. I used to rent a property from my mum. Me and my wife used to rent a unit in Cronulla in Sydney from my mum. It was a great unit, it was exactly where we wanted to live and suit our need perfectly and we rent it from her. But she was very strict with the rent and I did appreciate that. We tried as hard as possible to keep our relationship and to keep the finances separate so with that it was just like any regular rent or keeping that strict rental demand and not giving us too many leniencies. Every now and then we might be a little bit late but not very much because she was very strict on that. So I do appreciate my mum for doing that. So being strict and by keeping it very professional you can help to minimalize the risk of money screwing up that relationship. Next tip is to get a rental agreement signed. 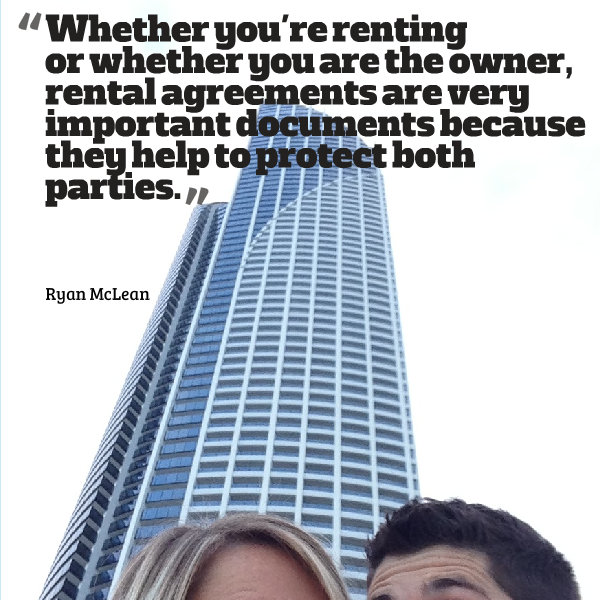 I recently had someone who was renting out their property that they owned to one of their friends and the friend (the person renting and living in the property) wanted to get a rental agreement. But the owner was like ‘Oh well, don’t worry about it’. But I do advise you get a rental agreement. Whether you’re renting or whether you are the owner, rental agreements are very important documents because they help to protect both parties. The renter is probably going to need that document to go ahead and to get help maybe from settling, or maybe they’re needed for work – there’s many reasons why they might need rental agreement. So for both parties it’s an important document to have, so I would suggest that you get one done. You can go to a lawyer and get one written up, you can buy them from news agencies (if news agencies still exist), or you can get them online as well. Obviously, the best thing to do is to get a lawyer to hurtle it and make sure everything’s great but not everyone can afford that. So you make your own decision on how you’re going to get the rental agreement. Next tip is to consider using a property manager. Yes, you’re going to have to pay to use a property manager – varies between 6 or 8 % of the rental yield that you’re getting. So if they’re paying $100 rent, then 6 or 8 dollar is going to go to the rental manager. But rental managers can be great especially if you don’t live local because they help to organize any maintenance that needs going on, they help to follow up rent if the person’s late and they again help to separate the relationship and the rental agreement. So it’s more of a professional thing and less likely to ruin the relationship you have with this family member or friend. Also means you don’t get calls at midnight saying ‘Ah the pipe’s just broken, you need to come around and fix it’, because the rental managers will handle all that sort of stuff and have emergency procedures in place for when stuff like that happens. No matter how much you trust your family member or your friend, it’s always a good idea to have landlord’s insurance. Landlord’s insurance covers you against a myriad of things. Obviously it’s going to cover the standard insurances, things like house burning down. But it can also cover thing like if something happens to the person who’s renting it from you, maybe they get sick, maybe they pass away, maybe they disappear and stop they paying their rent, maybe they damage the property and it helps you with all of those aspects which means you’re not going to be significantly out of pocket and it means you can continue to operate your daily life without being to impeded by this pressure that you have because the rental incomes are not coming in. So landlord’s insurance will help protect and is something that I do recommend everyone who’s renting the property look into. So there you have some ideas about renting your property to a family member or a friend. It can be done, you can arrange it, but you just need to think about these things before you go ahead and do it.